The Dial Press, 9781400069507, 208pp. Josh Ritter’s first novel is a wondrous, suspenseful, and uniquely affecting story of the journey taken by a father and his infant son. Henry Bright is newly returned to West Virginia from the battlefields of the First World War. Grief struck by the death of his young wife and unsure of how to care for the infant son she left behind, Bright is soon confronted by the destruction of the only home he’s ever known. His only hope for safety is the angel who has followed him to Appalachia from the trenches of France and who now promises to protect him and his son. Together, Bright and his newborn, along with a cantankerous goat and the angel guiding them, make their way through a landscape ravaged by forest fire toward an uncertain salvation, haunted by the abiding nightmare of his experiences in the war and shadowed by his dead wife’s father, the Colonel, and his two brutal sons. At times harrowing, at times funny, and always possessed by the sheer gorgeousness and unique imagination that have made Josh Ritter’s songs beloved to so many, this is the debut of a virtuoso fiction writer. Josh Ritter is a songwriter from Moscow, Idaho. His albums include "The Animal Years" and "So Runs the World Away." 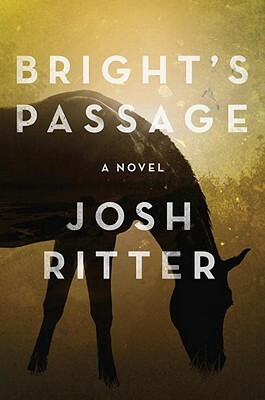 "Bright's Passage" is his first novel. He lives in New York.